Look carefully and you can see the café's proprietor, or perhaps his younger son, in his white apron leaning against the railing and the couple sitting by themselves on the far left who are almost certainly Mr. Herbert Buxton and his wife. Meredith Henshall's photograph would have been taken before the First War. An outdoor seating area, covered by a canopy, is an addition to the building and roof supports a sign, neither of which appear on the previous image. Presumably the canopy was for days when the weather was less pleasant. In this picture the waitresses are serving teas from there. "Just inside the gates of the Derwent Gardens is a Café and a green used for putting. A Mr. Bill Boden ran the Café for a long time ... for many years he was a resident of the Ferry House". "Bill" was John William Boden who eventually lived at Edinburgh House on South Parade and ran the dining rooms there. A 1926 guide book said that close to the Lovers' Walks "are the sheltered Derwent Gardens, beautifully laid out and with tree shaded walks by the river bank. Minor delights here are a cafe and a switch-back railway". In 1939 William Herbert Boden, a son of Bill, was living here with his wife, daughter, son in law Harold Hardy and other family members; he was recorded as "Cafe And Restaurant Proprietor Dep[ar]tmental Cotton Mill Foreman". William Herbert passed away, aged 64, in 1942. As a young man he had given little thought for his personal safety in an incredibly brave attempt to rescue one of the people involved in the Good Friday pleasure boating accident of 1897. The inquest into the tragedy heard that "Mr. William Boden, the son of Mr. J. W. Boden, a South End Confectioner, dived in at the risk of his own life, and brought the body [of Miss Elizabeth Holmes] ashore". She had unfortunately passed away before he could rescue her. The Café remained in the hands of the Boden family and their descendants until the end of the Second World War as members of the Hardy family were still living here in 1945; a baby was born at the Café in 1942. The Hardys, and William Herbert's widow Lucy Annie Emily, were to then run the Fountain Restaurant. of the Fountain Restaurant, Matlock Bath. 1. 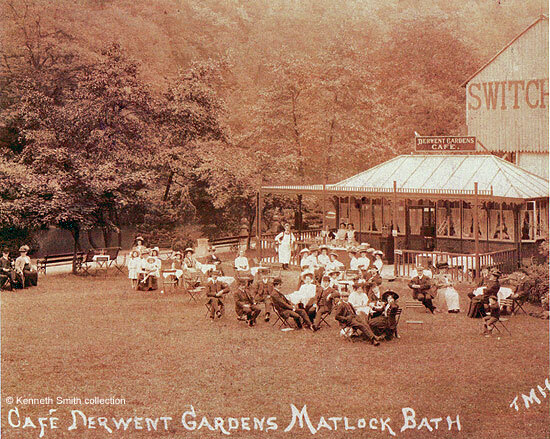 Postcard "Cafe Derwent Gardens Matlock Bath" from a photograph taken by Thomas Meredith Henshall. In the collection of and provided by and © Ken Smith. 2. 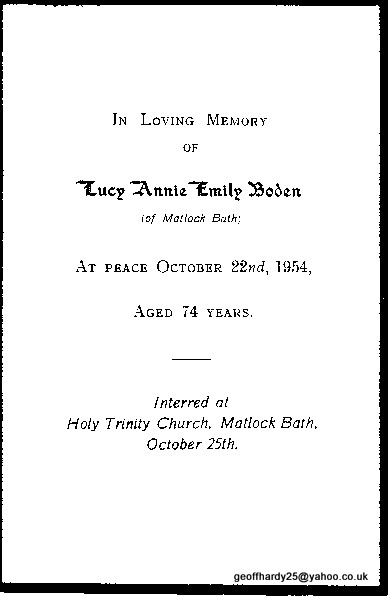 Memorial card for Mrs. Boden © Geoff Hardy, her grandson. Top image scanned for this website and information written, researched by and © Ann Andrews. Bill Boden's name appears in several trade directories between 1908 and 1925, for example Kelly's Directory 1908 | Kelly's Directory 1912 | Kelly's Directory 1916. He passed away at Edinburgh House in July 1928, aged 84. His elder son, Warren, succeeded him at Edinburgh House and a few years later became the licensee of Hodgkinson's Hotel. Ward Lock & Co's "Matlock, Dovedale, Bakewell and South Derbyshire", Illustrated Guide Books of England and Wales (1926-7). Information from the 1939 Register, available on FindMyPast. See the MI for William Herbert and his wife Lucy Annie Emily. "Derby Daily Telegraph", 19 April 1897. The Matlock Bath Boating Disaster. Opening of the Inquest. Kelly's 1932 Directory shows the proprietress of the Café as Mrs. W. L. Boden, almost certainly this was Mrs. William Herbert Boden. Geoff Hardy was born at the Café in 1942. An advertisement was posted in the "Derbyshire Times" of 16 March 1945 as the family were seeking a train set.